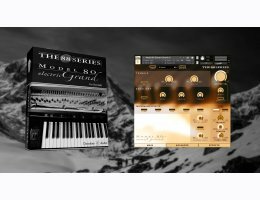 Sampled from a Yamaha CP80 compact electric grand, the Model 80 is a work of love and an homage to the sound that defined an era. The electric piano was properly restored and tuned before being sampled. Special care was taken in recreating the characteristic edgy sound of the middle registers, the shallow tone of the lows and the stingy highs. Maintaining a superb sound quality was Chocolate Audio's goal and it was difficult to achieve. The onboard electronics are noisy and the piano picks up a lot of ambient noise even if it’s electric (imagine a guitar with 88 strings and a pick-up for each single string!). Through their attention to detail and dedication, both in restoring, preparing, tuning and sampling this amazing piece of technical excellence, they managed to capture what they believe is the best rendition of this classic compact electric grand piano. Chocolate Audio's approach to sampled Instruments is to let the musician in you create, free of technical hassles. You just play. The learning-curve was reduces to a minimum, this is always a priority when they design their Instruments. But if you want to customise and refine the sound to the upmost, their multi-layer user interfaces allow for it, giving you the best of both worlds. The onboard effects don't require a degree in audio-engineering to make the best out of them. Just select one of the 23 main Presets and fine tune it using a few carefully selected parameters. The Compressor & Tape Emulation section, usually hard to grasp for the non expert in audio tweaking feature no less than 22 presets with a simple amount knob to adjust to your taste. Add to this 101 IR custom Reverbs, sampled especially for Chocolate Audio products.